Trucks come in a range of shapes, sizes and weights – so in the event of a truck requiring towing, it’s important that the right towing equipment is used to ensure a safe, problem-free tow. With towing.co.nz, you can search for the most professional, specialised towing services in New Zealand. We have listings for towing companies throughout the country – so no matter where you are, you can find a truck towing company near you. Just give them a call and they’ll arrange for the correct winching equipment, stabilisers, towing, transportation and recovery equipment to get your truck to where it needs to be. 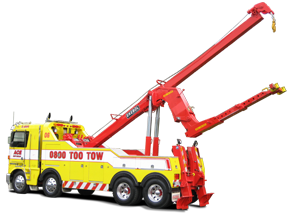 What types of towing vehicles are used for truck towing? The underlift tow is a common method of heavy vehicle recovery in New Zealand. The truck is lifted off the ground by attachments on the hydraulic underlift that folds down the back of the tow truck. Lifting forks are attached to the underlift and the arm is extended under the front or rear of the truck to lift on the suspension, axle or chassis of the vehicle. Hydraulic Anchoring Stabiliser Legs are attached to the truck and embedded into the ground to act as an anchor, so the tow truck’s winches can pull against the weight of the anchored truck. Whether you need a tow truck for an illegally parked vehicle, repossession, or for emergency towing after an accident or breakdown, you’ll find the right company in our towing directory. click on your closest region to find a towing company near you.